Will China's Bubble Implode and Bring the U.S. Down with It? It's the world's biggest and fastest-growing economic powerhouse, the subject of countless daily discussions and conjectures in the news media and an endless source of controversy, fear and confusion among investors, businessmen, politicians, bankers and bureaucrats. For those who follow the global economic outlook, it's probably the single-most important focus in trying to solve the global financial crisis. And answers to the questions surrounding this country's near-term future will undoubtedly have a momentous impact on your own financial future. It's also the subject of our commentary today: The China outlook. If you're like me, you've followed the China musings of many analysts and commentators over the years and you've probably been perplexed at how there can be so much disparity among what these analysts are claiming about China's financial and economic outlook. It would seem that the China observers are evenly divided into two camps: those embracing a bullish "the sky is the limit" outlook and those who say that China is merely a "paper tiger" just waiting to burn. Their statements are often diametrically opposed on the issues under discussion, leading one to ask, "How can so many China observers be so completely at odds with each other over a country so vast and important to the global economy?" Part of this reason, one can easily surmise, is due to the proverbial "iron curtain" that surrounds Chinese media and internal communications. China is still ruled by a Communist government and its rulers are known for having an almost paranoid desire to control internal and external communications among its people. It's sometimes difficult for those living in China to always get the scoop on what's going on within the country, let alone those living outside it. Another reason for the divergence of opinions regarding China's economic outlook is due to the country's vast size. Back in the 1990s, you couldn't attend a business meeting or investment conference without hearing some enthusiast talk about the boundless economic possibilities for U.S. businesses in the years ahead based on the soon-to-be-tapped consumer market in China. "A billion new potential customers" was an oft-repeated mantra among businessmen of those days in reference to China. I suspect this ingrained bullish belief in China's economic possibilities has left a lingering (and unreasonable) pro-China bias among American investors ever since. Due to these factors and others, it's hard separating the wheat from the chaff when it comes to analyzing China's economic outlook. Will China continue its stellar rates of industrial production of recent years or will the lingering impact of the global credit crisis dampen its economy? Will the yuan someday eclipse the dollar as the most dominant currency or not? Will China surpass the U.S. as the world's leading global superpower or won't it? Basing our economic arguments for or against China based on fundamental data (which can admittedly be deceiving) and relying on our limited capacity for sorting through the many complex variables involved would make a decisive answer on the China question virtually impossible to attain. Yet there is one source of knowledge that we can go to that will give us a surprisingly accurate answer as it concerns the interim economic and financial outlook for China. That source is none other than the stock market, the ultimate barometer of business conditions. There seems to be an emerging consensus among investors that China is "decoupling" from the West and has developing its own domestic markets to the point where it needs no longer to rely on export growth to the U.S. for its economy strength. As debatable as this prospect is (and there are valid arguments on both sides), our main focus is on the financial outlook for China. Two things stand out. The first is that the iShares China 25 Index Fund (FXI), our proxy for the China stock market, has been notably lagging the recovery in the U.S. broad market S&P 500 index in the past few months. While the U.S. stock market has recently made an 18-month recovery high, shares of Chinese companies as measured by FXI are still below their previous high from November 2009. Another observation is that the China stock internal momentum indicator series (CHINAMO) is showing far less internal strength than it did in 2009. Indeed, the dominant interim momentum indicators for the China stocks have been rolling over of late and the short-term indicators have been in decline for some time. This is reminiscent of what the long-term NYSE hi-lo momentum index looked like in 2007 heading into the credit crisis. 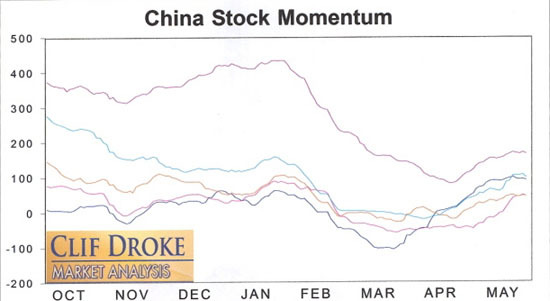 Beyond the possibility of a short-term rally, the longer-term momentum structure for Chinese stocks is troubling. Unless it shows substantial improvement in the weeks immediately ahead, this troubling internal pattern could set the stage for bigger financial troubles ahead for China. These indicators are a reflection of the incremental demand for the leading U.S.-listed China stocks; and, with demand clearly slowing and even turning downward, it doesn't bode well for China's stock market outlook, which, in turn, is a "heads up" for that country's economic outlook. There has been growing talk of an unsustainable building boom taking place across major Chinese cities. Indeed, many mainstream financial publications have taken to using the word "bubble" to describe what is happening in China's real estate sector. As financial analyst Dr. David Eifrig has recently observed, "The Chinese built infrastructure, real estate, factories, and even stockpiled commodities as if the world would grow to the sky. Throw an Olympics in the middle of the global boom, and you have a tremendous bubble." Dr. Eifrig's conclusion is a sobering one: "Now that the borrowing of cheap money has ended, China has no more buyers. As borrowers default and declining asset values collapse balance sheets of corporations and consumers in Europe, the U.S., and Japan, demand has dried up. The money China gets from the world's profligate spending has ended. . ."
Gold investors would do well to take note in the latest development in China as well. 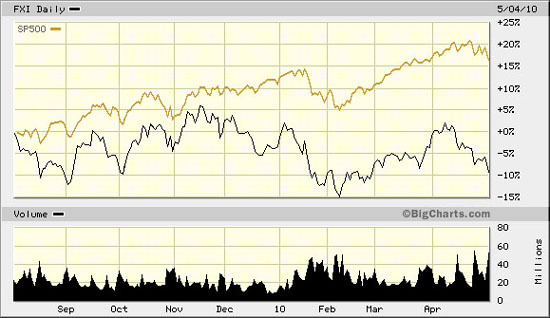 What's interesting to note is that not only has there been a decoupling from the U.S. stock market, but the China stock market has been closely correlated to movements in the price of gold, especially in the last several months. 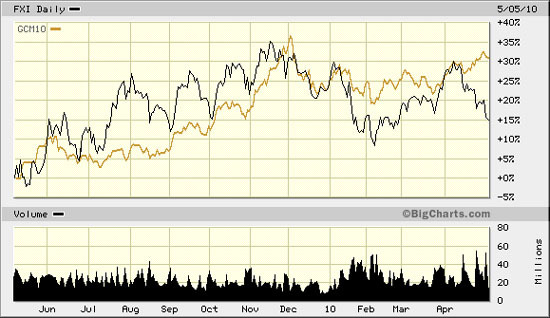 Comparing the FXI to the SPDR Gold Trust ETF (GLD), a proxy for the gold price, the similar trajectories can be easily seen. China's appetite for gold is well known and until its near-term financial condition improves, it's likely that the gold price will move more or less in harmony with China's stock market, as has been the case in recent months. "The primary reason manufacturers move overseas is purely cost savings. Companies do not move to China for any reasons other than cheap labor. So cheap labor drove manufacturing companies overseas. But America's cost structure was not rising—it was falling. Meanwhile, China's costs were rising fast. All of this could bring a massive readjustment in currency values. What would that mean? First, a reduction in the value of the USD. What would a weak dollar really do? A low value dollar, along with a rising yuan (China's currency) could make any manufacturing overseas commercial unfeasible. That is, the American companies would see no reason to set up factories in China to export to the U.S."
"The latest data from Red China [shows] State-owned banks have been throwing cash at any communist party member who wants cash to buy. It is all part of a plan to replace consumer sales to Americans. The trouble is that this fast spread of easy money has already begun producing a giant expansion of bad debts in China." "But there is one nation that is riding a bubble right now and that nation is the People's Republic of China. Henry Kissinger once told President Nixon that the Chinese people are the smartest on Earth. Yet there is a defect in their official national character that has brought them from very high levels of achievement to very low levels of failure a dozen times over the past 4,000 years. They would build dynasties and conquer nations on all sides, forcing these captive people to pay tribute to the Chinese Imperial Court. "But then pride turned to arrogance and arrogance caused them to make mistakes—big mistakes and a lot of them. . .Each time that one of their dozen rich dynasties fell, China endured long periods of awful poverty. I suspect that will happen again. . .The Chinese State Bank is spreading billions of dollars in loans around to encourage wild consumer spending by communist party members. . .all to replace lost sales resulting from the sharp drop off in American consumer products important from China. China's money has been pushed up in value 20% since Bernanke took over the Fed. Greenspan allowed them to cut the value of their Yuan by a lot (the higher the number per dollar the cheaper the yuan) and then freeze it." Van Eck concluded, "Because of strong domestic inflation, China can no longer afford the kind of cheap prices they have offered [in the past]. The game is about over for them. And at the same time I expect manufacturing plants to begin coming back to America." Is China's economy setting up for its first major debacle since its aggressive growth spurt began? If so, it will almost certainly be preceded by a pronounced decline in China share prices, which appears to be already underway. To that end, we'll be focusing our attention closely on the Shanghai Composite stock index as well as our favorite proxy for U.S. listed China shares, the China 25 Index Fund (FXI). The next question that logically follows this is, "If China implodes, what will happen to the U.S. economy?" There are a couple of cyclical considerations that can be addressed in this regard. The first is that while the famous 4-year "business cycle" is scheduled to bottom later this year, around late September/early October, once the cyclical pressure from this lifts the U.S. financial market should be in a position to resume its leadership position among the major countries, including China. If we assume China is well into a decline by that time, we can project a scenario in which the U.S. shrugs off this external divergence, much as it did when Japan's stock market and economy collapsed in 1990. That leaves the last of the long-term yearly cycles, the 6-year cycle, to push the U.S. stock market into one final growth spurt into 2011 before it peaks next year. It would be easy, and perhaps tempting, to come to the conclusion that "as goes China, so goes the U.S." Yet in spite of attempts of connecting both economies in recent years, the internal dynamics of both countries are quite pronounced and dissimilar. The U.S. still has recovery potential and has already proven its resilience in the wake of an unparalleled credit disaster. It's still too early to count the United States out completely, and with the yearly cycles still favorable for the U.S. business outlook for at least one more year, the guess here is that the U.S. will trump China in 2010–2011 as the most favored destination for investment capital. Over the years, I've been asked by many readers what I consider to be the best books on stock market cycles that I can recommend. While there are many excellent works out there on the subject of technical and fundamental analysis, chart reading, etc., precious few have addressed the subject of market cycles. Of the relatively few books on cycles that are available, most don't even merit mentioning. I've read only one book in the genre that I can recommend—The K Wave by David Knox Barker—but even that one doesn't deal directly with stock market cycles but instead with the economic long wave. I'm pleased to announce, however, that after nearly 10 years of research and one year of writing, I've completed a book on the subject that I believe will meet the critical demands of most cycle students. It's entitled, The Stock Market Cycles, and is available for sale at http://clifdroke.com/books/Stock_Market.html. Clif Droke is the editor of the three times weekly Momentum Strategies Report newsletter, published since 1997, which covers U.S. equity markets and various stock sectors, natural resources, money supply and bank credit trends, the dollar and the U.S. economy. The forecasts are made using a unique proprietary blend of analytical methods involving cycles, internal momentum and moving average systems, as well as investor sentiment. He is also the author of numerous books, including the recently published volume, The Stock Market Cycles. For more information visit www.clifdroke.com. 3) Victor Goncalves: I personally and/or my family own shares of the following companies mentioned in this interview: Western Lithium, Salares Lithium, Avalon Rare Metals. All companies with the exception of Dacha are client companies.